Three years after the completion of Trinity Church, H. H. Richardson was invited back by the congregation to design a rectory for Rev. Phillips Brooks. Located just over a block to the north of the church on a corner lot at 233 Clarendon Street, the building shows Richardson’s mastery of a monochromatic palette to achieve a sophisticated and elegant design. Richardson received the commission in April 1879 and the building was completed the following year. The exterior is clad in a locally made hard red brick with trim of Longmeadow brownstone. A balanced, asymmetrical façade is centered by the most commanding feature of the house – a low sprung arch surrounding a deeply recessed entry porch. Decorative stonework set within the arch over the door and three-part windows features Richardson’s trademark eight-petaled flower set amidst bands of triangles and simple geometric leaves. Foliate designs enliven the base of the arch, its inner perimeter, and the stair newel, while a band of double dentil trim surrounds the outer edge of the arch. The pitched roof features a forward-facing gable at each end and two dormers of different sizes in between, each with a different window configuration. Of particular note is the finely laid brickwork set at 45 degree angles creating subtle triangular panels along the sides of the gables. Bricks are laid in soldier courses at the level of the second floor windowsills, and a band of brickwork creating a checkerboard pattern is set between courses of brownstone framing the transoms of the first floor windows. The second floor is dominated by three large panels of cut brick, in floral and foliate designs. The irregular arrangement of the windows reflects the interior configuration of the house. One of the most prominent spaces was Brooks’ library, which was featured in Artistic Houses: Being a series of interior views of a number of the most beautiful and celebrated homes in the United States published in 1883-1884. The room was located at the south end of the first floor with the brick and stone fireplace placed in an alcove set within a projecting bay. After the death of Rev. 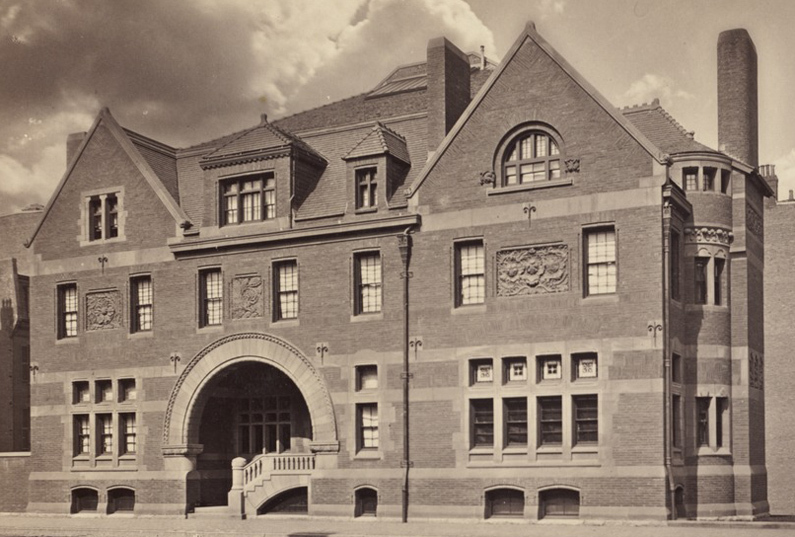 Brooks in 1893, the building was enlarged by Richardson’s successor firm, Shepley, Rutan and Coolidge, which added the present third floor. Their design closely mimics the second floor below (without the decorative brick panels), and Richardson’s top floor was rebuilt above according to his original design.